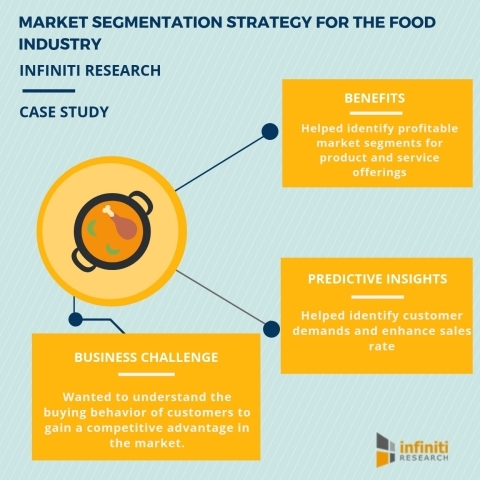 A renowned market intelligence solution provider, Infiniti Research, has recently announced the completion of their latest market segmentation strategy for a food industry. The study highlights how the client was able to understand the buying behavior of customers and identify different segments based on customer interests to gain a competitive advantage in the market. With changing customer preferences and market requirements, companies consistently need to gain a detailed analysis of the market to understand the needs of customers. Market segmentation strategies helps in doing so by effectively understanding customer behavior and carrying out marketing strategies in a systematic way. The lack of market segmentation strategies can result in huge loses in terms of sales, leading to a sharp decline in the market position. This has compelled the companies in the fast food industry to segment their customers into sub-groups based on certain characteristics and to implement strategies that suit the needs of different focus groups. To know more about the significance of Infiniti’s market segmentation strategies in spurring the growth of businesses, Get in touch with our experts! The business challenge: The client is a leading fast food store, with more than 150 outlets globally. The company sells high-quality fast foods and beverages and was looking to expand their access to new geographies. With the rising competition in the market and evolving customer preferences, the client realized the need for a robust targeted marketing approach and a better market segmentation strategy to cater to the demands of the global customer base. Additionally, by continuously monitoring their target customers’, they wanted to introduce new products that meet their customers’ demand and subsequently reduce customer churn. A market segmentation strategy can provide you with more insights into your target customers. Request a free proposal and know how market segmentation strategies can help your business. The solution offered: With the help of Infiniti’s market segmentation strategies, the client prioritized areas of improvement and identified customers’ need to gain a competitive edge in the market. This further helped them better serve their target customers and reduce customer churn. Moreover, the market segmentation strategy helped the client make necessary adjustments in their marketing initiatives and enhanced company’s profit margin by 13%. Wondering how your business can benefit from Infiniti’s market segmentation strategies? Request more information from our experts! Interested in achieving high growth for your business? Request a free proposal to know how our market segmentation strategies can help you with the necessary insights.